Presented here are five different photographs of adult house dust mites accompanied with facts of interest. They are here to encourage the study of mites in schools. Although the five mites have been seen through a scanning electronic micrograph, it is worth remembering that each mite in reality is approximately the size of this dot . in other words barely visible. Here is a healthy adult mite whose body is so full of water that it appears transparent. 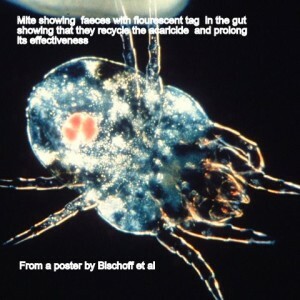 Active mites are 75%water in weight, and must maintain this water in order to breed.To get to this stage the mite has passed through six separate stages of life. They are: egg and pre larva egg (with an egg tooth just like birds), larva, two stages of immature nymph, and adult. 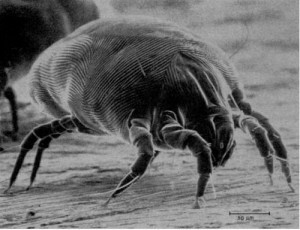 In best conditions house dust mites can live for 6 to 9 weeks. Ideal conditions are warm, still, dark, and damp with plenty of decaying organic matter available. Another look at an adult mite. Notice the fine finger-print like grooves on its back through which the mite exchanges gases from the atmosphere. This shell like covering also acts to protect the mite. 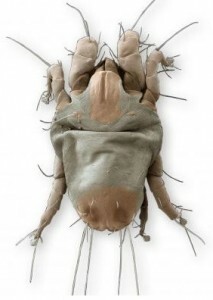 On the end of its eight legs are suckers designed to grip surfaces as the mite moves about. Although the mite is blind, it has an exquisite sense of smell that picks up messaging through pheromones from other mites. The messaging can signal alarm or mating potential. The sensors protruding from the mite are thought to give off, and pick up vibrations. 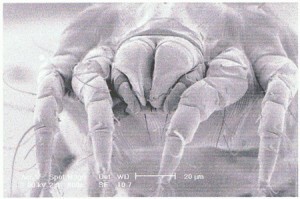 Here is the front view, or mouth area of the mite. Notice the channels on either side of the mouth. In good conditions, a special 'salty' fluid gathers moisture from the air and runs down the channel to the mite's mouth to feed it water. If there is not enough water available, the fluid turns hard and acts as a stopper to prevent any water loss, which can mean death to the mite. Credit, G. Bauchan and R. Ochoa. This house dust mite has lost water and is either dead or in a state of hibernation waiting for moisture to return. His shell has collapsed through water loss. There is an interesting aspect to this mite. He is a fighter mite or warrior. His front legs have grown large and are weapons designed to kill competing adult male mites. He comes from a colony with too few breeding females and is fighting for privilege. 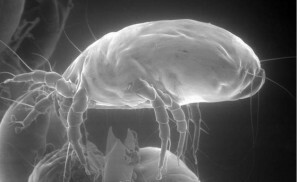 Finally, here is a house dust mite that has been poisoned by man. It has eaten a food contaminated with an acaricidal product (Acarosan) and will soon die. Before death the mite will excrete the remains of the poison in a dropping that other mites may consider as food. Poisons that kill house dust mites usually come from natural products such as tea-tree oil or eucalyptus. Acarosan contains benzyl benzoate, a chemical derived from the plant 'Kaempferia rotunda'. Poison is just one of five ways to kill or control house dust mite populations. Common methods of control or to eliminate house dust mites are: hot washing, freezing, dehydration, exclusion (including micro-porous covers), placing infested items in a hot dryer, poisoning or placing small items in a good microwave oven, on high for five minutes.